Congratulations to Matthew Weller! Matthew is the winner of JustWipe’s ‘Tablecloth of the Month’ competition for September 2018 and a £20 Marks & Spencer voucher will be with him shortly! 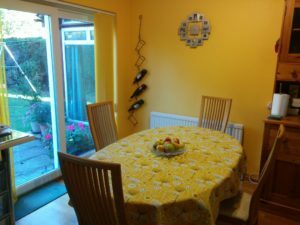 Matthew’s winning photograph was of his lovely ‘Bergen Mustard’ matt vinyl coated tablecloth. This pretty pattern is also available in a gorgeous shade of grey. If you would like to enter your photograph into October’s competition, all you need to do is post it to our Facebook page or send us a Facebook message. If you prefer, you can also email us with your photograph at marketing@justwipe.co.uk. Perhaps we’ll even see some spooky Halloween pictures this month! Have a wonderful October from all the team at JustWipe!